This page was added on 19/01/2016. 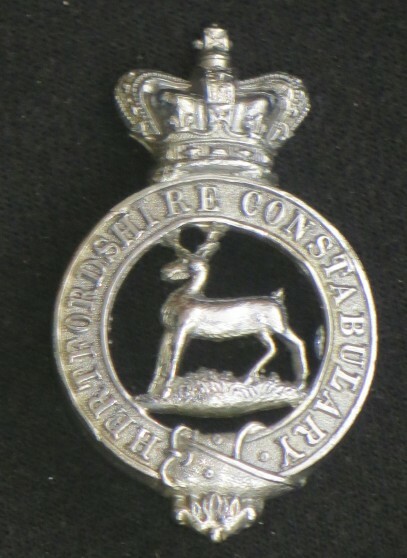 Believe it or not this cap badge is still the current design worn by Hertfordshire Constables and Sergeants on peaked caps (male officers) and pathfinder helmets (female officers). Based on a number of historic photographs I have seen, this particular design was first adopted by the Constabulary in the 1940’s. Prior to this the hart was on a solid background, rather than a ‘cut out’. It has often puzzled me why the badge has retained the crown of Queen Victoria, rather than adapting those of successive kings and QEII like all other UK forces. It is quite unique in that respect. Similarly, I don’t know why it is generally smaller than those worn by other forces. My best guess is that it was adapted at a time when metal was scarce and a larger badge was considered too lavish for wartime. Andy Wiseman – serving Herts officer and Historical Society secretary. I’m a former Police Cadet with Surrey Constabulary who due to a spinal injury never had the opportunity to serve. I collect Police memorabilia and I recent had this badge come into my collection and would like to know its history regarding period used and why it’s so much smaller than all other cap badges from this era.